Finally! After all of the requests we have had, we are adding a personalized male Belly Bear nurse/EMT ornament to our collection of personalized Belly Bear ornaments. 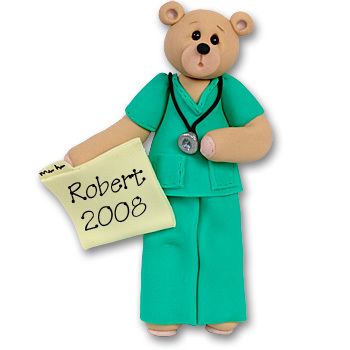 This darling male nurse ornament may be personalized with a name and year on his chart. He makes a wonderful gift whether giving as a Christmas ornament or birthday gift. Comes complete with a hook and satin ribbon for hanging. He is handmade from polymer clay and designed by Debi Allison. Measures approximately 4¼" H x 3" W.